Baird, Spencer Fullerton and George N. Lawrence. This collection of letters, between famous naturalists Spencer Fullerton Baird and George Newbold Lawrence, offers an interesting glimpse into the day-to-day workings of American natural history at a critical time in its nineteenth century development. The exchange covers the period between 1869 and 1872 with the two corresponding at least three times a month, Lawrence from his home in New York and Baird from Washington, D.C. and his summer homes in Maine and Wood’s Hole, Massachusetts. 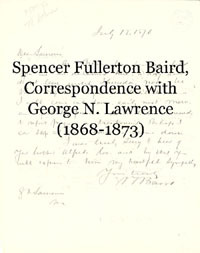 Letters included here comprise both Baird’s original correspondence, some with notes and reminders written in Lawrence’s hand, and seventeen notes and drafts of Lawrence’s answers to his friend and colleague. Baird at the time was the assistant secretary of the Smithsonian Institution; President Grant also named him as the first Commissioner for Fisheries in 1871. George Newbold Lawrence was born in New York City in October 1806 and entered his father’s wholesale drug firm at an early age, rising to head up the company in 1834. He used his wealth and his position to turn increasingly to the study of ornithology that had been his passion since he was a child, living near and befriending the sons of the famous John James Audubon. Lawrence met Spencer Baird in 1841, and he fell under the influence of this tireless naturalist in a relationship that lasted the rest of their lives. Together with John Cassin of Philadelphia, Lawrence assisted Baird in the publication in 1858 of volume nine, on birds, of the government study on the explorations and surveys searching for the best route for the trans-continental railroad. This work, revised and expanded, became The Birds of North America in 1860. Lawrence continued his studies and became an expert on the birds of the Caribbean and Central America. He was among the best-known collectors of his day – he is credited with naming more than 70 species – and his 8000-specimen collection became part of the American Museum of Natural History. His support for his fellow naturalists was extensive. Baird, especially, took advantage of his druggist background to have him support expeditions from the Arctic to Panama with needed chemicals and supplies. Lawrence died in New York City on January 17, 1895. The letters between these two men illustrate the drive and the activity of the many amateur and professional naturalists cooperating and competing in this remarkable time for natural history. The energy and enthusiasm of Baird is especially evident. Efforts to identify and catalogue species depended heavily on naturalists working together and exchanging specimens and bird skins. The names of many of the leading ornithologists of the century crop up again and again in the letters. British luminaries George R. Gray, head of the ornithological section of the British Museum for four decades, and Philip Lutley Schlater, secretary of the Zoological Society, exchange information with the pair. Others include French naturalist Francois Sumichrast, who asked Baird unsuccessfully for Smithsonian funding in May 1870 in Mexico, and the famous Costa Rican Jose Deledon, who was then collecting in the West Indies. Baird’s other influences on American natural history are made clear with his mention of young protégés like Robert Kennicott, Elliot Coues, and the teenaged Robert Ridgeway. Baird mentions Ridgeway’s first scholarly article, noting to Lawrence that “we may make something of him” (Oct 30, 1869). The painstaking day to day advance of the science of discovery and classification is illustrated throughout the correspondence as the two men exchange specimens and discuss whether species are original or not. Baird sends Ridgeway, “a very quiet, unassuming, modest fellow” (April 26, 1871), to New York to compare collections and eradicate duplications, what Baird called “the smashing up of species” previously thought to be original. Baird enlists his well-situated friend Lawrence in the shipping of supplies to expeditions and “correspondents” in the field, sending everything from clothing to small arms ammunition to R. R. MacFarlane in the Canadian Arctic, and chemicals to Henry Hague in Guatemala. All this the faithful Lawrence carries out with dispatch. It is this tireless activity and enthusiasm of Spencer Fullerton Baird that stands out. Whether writing from Washington, D.C. or his summer homes, Baird is at the heart of American natural history. He is recruiting scientists for upcoming government expeditions (such as the 1870 Darien Expedition to explore a route for a Central American canal), buying, selling, and consolidating collections for the Smithsonian, or trying to get the aging gemologist Lewis Feuchtwanger to donate his mineral collection to the Smithsonian (April 13, 1872). The letters, as mentioned, span the days of Baird’s initial appointment to be the first United States Commissioner of Fisheries. He mentions this appointment to his friend Lawrence in March 1871 and immediately is at work making a “complete collection of all the different kinds of fishing apparatus” and positioning Wood’s Hole as the famous research center that it will ultimately become. By the summer, he displays a remarkable knowledge of commercial fishing statistics and begins to worry about the over-fishing of depleted stocks. Spencer Fullerton Baird would serve at his fisheries post for sixteen years, and, of course, he also later became the head of the Smithsonian Institution in 1878. This collection of highly specific working discussions on the science of the day between he and his loyal and generous collaborator demonstrate the central place of his active and enthusiastic mind in the history of nineteenth century American science.